Hellgrammite is entering the Clash of the Chitins in order to prove herself worthy of earning her wings. Her species, which has mutated over decades due to pollution in the streams, is known to possess a bite that feels "like Hell". 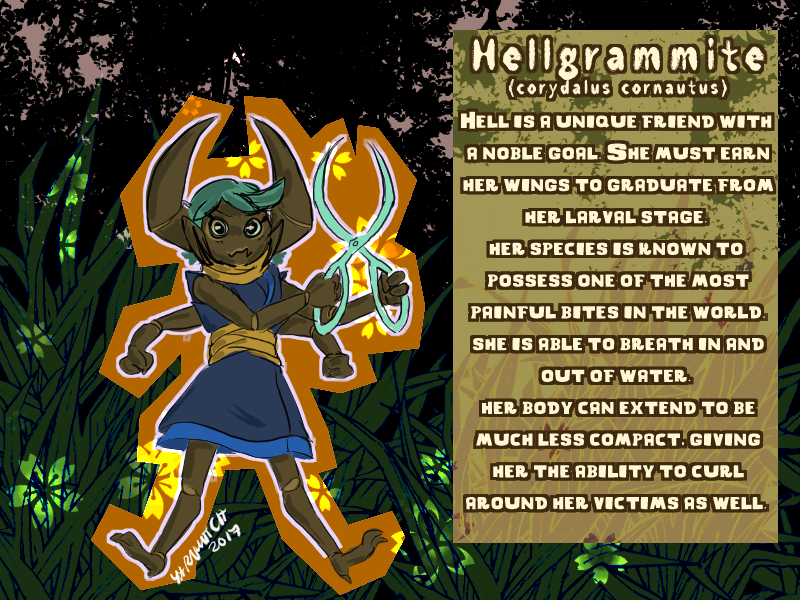 She is able to breathe in and out of water, and her body segments are made of a very unique natural fiber that allows her to remain protected, even while stretched out, which she does at times to wrap around her opponent to give better leverage with her bites. Her favored weapon is the traditional sharp tongs, an homage to the adult males of her species. Though the females are more powerful with their bite, the males are intimidating, so the tongs provide a good medium between the two.